An artist's search for a new way to create color could compel science to ask a few new questions of its own. An artists search for a new way to create color could compel science to ask a few new questions of its own. 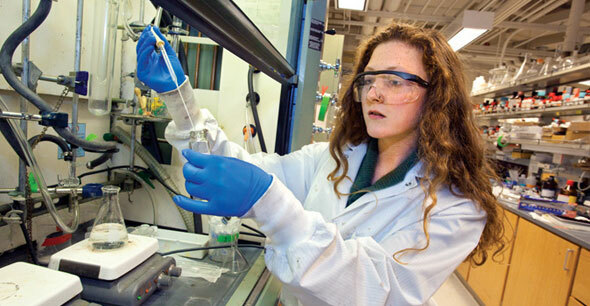 Clad in a white lab coat and safety goggles, Kate Nichols looks no different from the other members of Paul Alivisatos nanotechnology research group at the University of California, Berkeley. But Nichols is no ordinary grad student. Shes the labs artist in residence. Like her lab mates, she has spent a great deal of time mastering the art of brewing solutions of nanoparticlesparticles so small that their widths might span a few dozen to a few hundred atoms. But while the others are concerned with tweaking the physical and chemical properties of nanomaterials for optical communications, light-emitting diodes, or next-generation transistors, Nichols is exploiting their visual characteristics in the name of art. "I was thrilled that someone wanted to work at the intersection between art and science," says Alivisatos, a pioneer in the relatively new field of nanotechnology and the director of Lawrence Berkeley National Laboratory. "These are two domains of human activity that are inextricably linked, but often are portrayed as being opposites." Nichols learned about nanotechnology listening to science programming on National Public Radio, which helped break the silence of her days in the studio where she worked full time as a painter. The concepts brought back to mind an idea she had filed away years earlier: structural color, or the color produced through geometry, architecture, and design rather than by the chemical compositions of pigments. A former professor had introduced Nichols to the wing structures of the Morpho butterfly, which demonstrate this effect, and she had sought a way to incorporate the phenomenon into her artwork. One way to achieve structural color is by constructing thin, multilayered surfaces, much like a Flemish oil-painting technique Nichols used quite often. Carefully overlapping up to 20 or 30 layers in a single painting allows light to briefly permeate and dance among the pigments, bestowing an ethereal quality to her depictions of the human body. But even the thinnest layers of oil paint were orders of magnitude too thick to create true structural color. 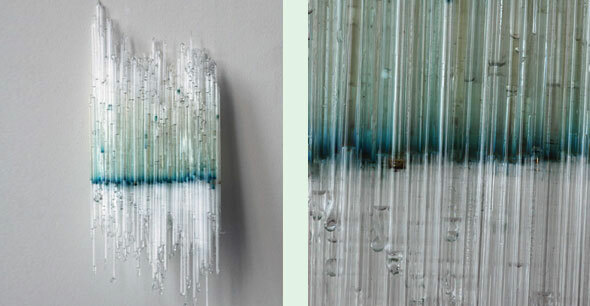 Hysteresis, 2009 8 inches x 20 feet Silver nanoparticles, glass pipettes. "Listening to radio programs about nanotechnology got me thinking about structural color again. I realized that there are people out there with access to architectures small enough to create this kind of color," Nichols says. A casual Internet search led her to Alivisatos; Nichols says shes ashamed to admit she did not realize at the time that he was such a distinguished figure. 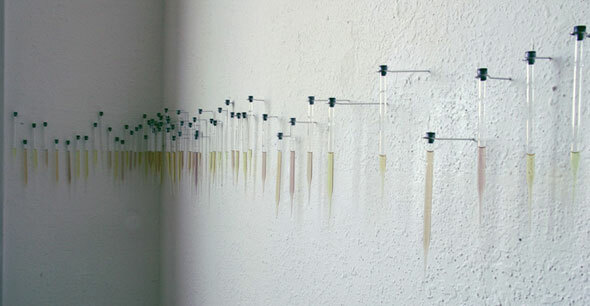 She sent him a brief email explaining her ideas for using nanotechnology to produce structural color, and asked whether he thought they would work. 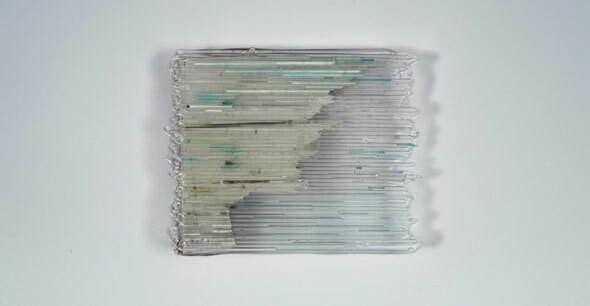 Untitled, 2010 3.5 x 5 inches, Silver nanoprisms, glass capillaries, plywood. 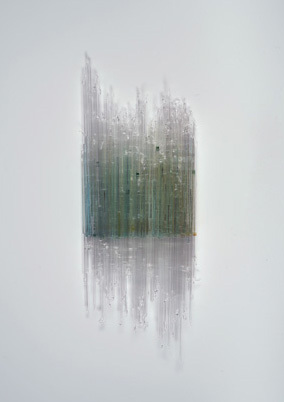 Hysteresis: luna, lunar caustic, 2009 17 x 4 inches, Silver nanoparticles inside silver-mirrored glass tubing, wax. Alivisatos was so intrigued by the idea that he invited Nichols to work in his lab and find out for herself, making Nichols a pioneer in her own right. "With nanoparticles, theres a sense of discovery, a sense of mystery," she says. "Its novel. No one has worked with them in this way before. "I did a lot of reading before I joined the lab, but I didnt really know what would prepare me for that experience. I think I focused too much on reading at first," Nichols says. Her biggest breakthroughs came from a tactile, hands-on approach to learning: "It was similar to being a painters apprentice. It was following around grad students and postdocs and watching what they did, taking notes, repeating things over and over again, making mistakes and learning from them." 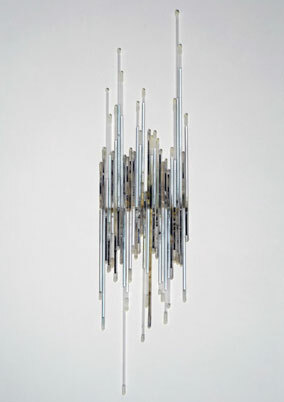 Suspension 3, 2009 8 x 5 inches Silver nanoprisms, glass capillaries. But after a year in the lab, Nichols had little to show for her mistakes; she hadnt created a single piece. What she did have were boxes of nanoparticle-coated microscope slides, vials of muddy-colored solutions, and meticulous notes on what worked and what didnt. "It was frustrating for me as an artist. Im used to producing things. But my lab mates told me I had accomplished so much," Nichols says. For someone with almost no science background, she had picked up the chemistry and synthesis techniques quickly, and her lab mates marveled at her genuine curiosity and desire to learn. Finally, Nichols decided to let the nanoparticles do what they wanted to do naturally. "I had all these nanoparticles in a liquid and started thinking about what liquids are good at, so I played with the fact that liquid finds level," she says. She sucked solutions of nanoparticles into glass capillary tubes and torched the ends, sealing the particles in a vacuum. At first, triangular silver nanoparticles gave the solution an even, turquoise hue; but molecules in the liquid knocked into the nanoparticles and gradually rounded their cornersmuch like a river slowly smoothes the edges of a stone. As the nanoparticles transformed from triangles to discs, they turned royal blue and settled to the bottom of the solution. "After that I dont know," Nichols says. And neither do many scientists, because no one has bothered to keep solutions like these around for very long. Scientists who study these types of nanoparticles generally manufacture them in quantities small enough, and on time scales short enough, to take measurements and images, with little regard for preservation. Nichols speculates that it's possible the triangular particles could become spheres, which are an energetically favorable shape. Or they could aggregate and become bulk silver, in which case they might look like specks of dust floating in a clear liquid. "Their unpredictability is part of their charm," Nichols says. "These pieces are participating in the science instead of just using the science." 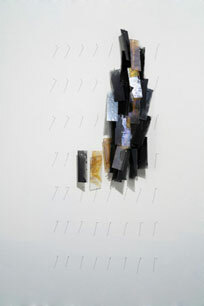 But as a painter, Nichols is also concerned with making her pieces last forever. 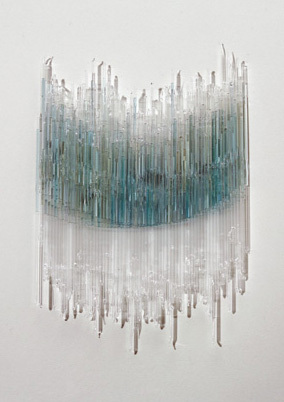 While the future of the capillary tubes remains to be seen, she has created other pieces out of glass plates that have a better shot at standing the test of time. Nichols coats the plates with silver nanoparticles and then stacks several plates on top of each other, backed by a sheet of mirrored silver. The particles have optical properties that paint pigments dont: While pigments work by reflecting certain wavelengths of light and absorbing others, the silver nanoparticles reflect blue light while transmitting red, orange, and yellow. The transmitted light is in turn reflected back to the viewer, so the dominant color of the piece changes depending on the color of the incoming light, or even on what—or who—is in front of it. "This opens up a lot of questions about what color really is," Nichols says. "And I think thats really engaging. I hope my work causes more questions than answers." The first photograph was taken in June, and the second is a detail.